​Should you change your quilt for spring? The primary function of quilts is warmth, making them somewhat of a confusing item of bedding as the seasons change and temperatures start to rise. There’s been much discussion around the water cooler this week about whether you should still have a quilt on your bed when your overnight goal is to stay cool and, if so, whether some quilts are better suited to the warmer months than others. If you’ve been asking yourself the same thing, you’ll be pleased to know you’ve come to the right place. Grab a cuppa, find a comfy spot and get ready to learn. So, should you change your quilt with the seasons? In short, it depends. We know this probably isn’t the clear cut answer you were hoping for, but hear us out. Depending on factors like our age, gender, body composition and base metabolic rate, we all experience different temperature sensations while we sleep. For example, young children tend to sleep warm because of their high metabolic rate, while women tend to feel the cold more than men thanks to basic gender differences in body fat distribution. Further complicating things is the fact that, like humans, no two quilts are made equal. The type of fabrication, GSM, loft and construction of your quilt will all impact its ability to keep you warm. If you’re wondering what these terms refer to, don’t worry: we’ve included a guide below to help you find your perfect match. The final variable when it comes to quilt suitability is, of course, climate. While someone in Hobart might only have a few weeks a year of high temperatures, someone in Darwin is likely to be relying on the air con from October through to March in order to avoid middle of the night sweats. With all these variables at play, we can’t tell you whether you should change your quilt, however, what we can do is provide two key questions you can ask yourself in order to work it out. First of all, do you find yourself throwing your quilt on and off multiple times a night? If so, this is a good indication you need to invest in a seasonal quilt, as it sounds like you can’t maintain the right sleeping temperature with your current one. Secondly, are you able to keep your bedroom at a relatively stable temperature year-round, thanks to good insulation, reverse-cycle air con, or a relatively stable climate? If no, you should also consider a change. What should you look for in a spring quilt? As we mentioned earlier, quilts come in many shapes and sizes and therefore depends on your bed size. As we also mentioned earlier, their qualities can be measured through various components that have funny sounding names like ‘loft’ and ‘GSM’. Here’s what each of those words mean and what you should be looking for if you are in the market for a spring quilt. Quilts can be filled with all manner of materials, from down to wool and even silk. 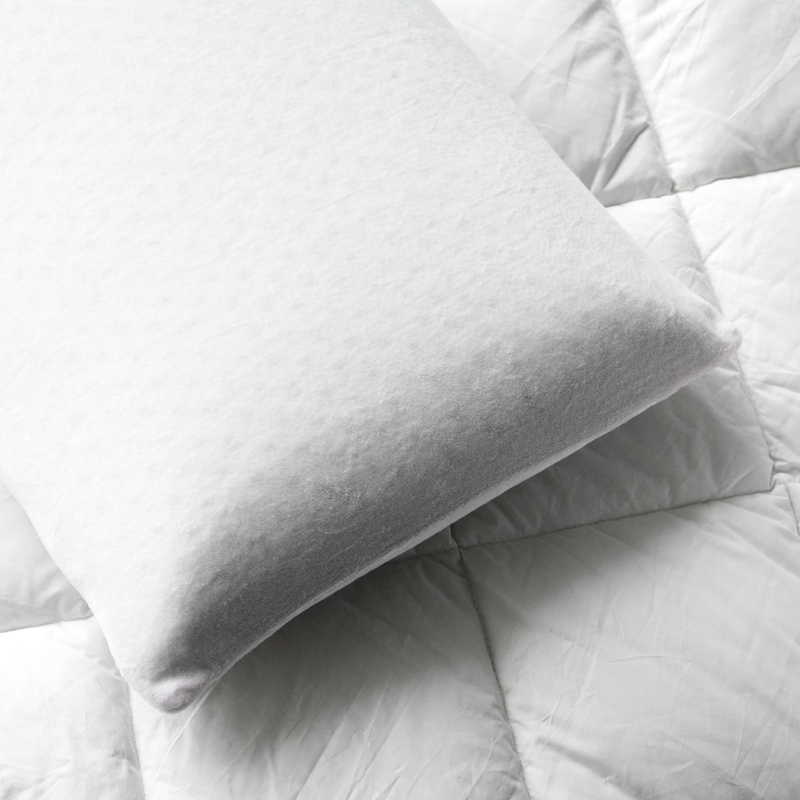 If you’re looking for a warm-weather-friendly quilt and love the feel of feathers, consider buying a microfiber version. They offer a very similar feel, have the added benefit of being hypoallergenic and come in a variety of weights (see below for more guidance on this aspect). If you’d rather stick with natural fibres, opt for lightweight wool. Wool fibres are warm but very breathable and have an excellent ability to adjust to your body’s temperature and facilitate its cooling process (i.e. perspiration), making them ideal for the change of seasons. GSM stands for grams per square metre: the higher the GSM, the warmer the quilt. The ideal GSM for spring (at least in most climates) is 350, which is exactly what you’ll find in our Luxury Quilts. It provides enough warmth and weight to see you through the chillier nights of the season, but is light enough that you won’t be constantly kicking it off when the mercury hovers around the mid to late teens. Loft is another measure of a quilt’s warmth and is based on height or thickness. Anything labelled as ‘light loft’ is your springtime friend. It’s roughly equivalent to 300 GSM or the warmth of two blankets. The way a quilt is constructed dictates how the filling will move around inside. The two main forms of construction are boxed, where the quilt is sewn into a number of secure cross-sections to ensure an even distribution, and channel, where the quilt is sewn into long parallel sections, allowing the filling to move around at the whim of gravity – or very determined hands. While channel quilts can be massaged to create slightly cooler spots, they’re not as good for temperature regulation as the boxed variety, so opt for one that does have secure sections sewn in. Once again, our Luxury Quilts fit the bill, thanks to their diamond patterning. Hopefully you now know: a) whether you should be looking into changing your quilt as spring takes hold; and b) what your ideal spring quilt might look like. If you will be making a new investment this season, remember to give your winter quilt a clean before you put it in storage so it will be fresh and bacteria-free when you need to bring it out again next year. Finally, if you are finding your quilt makes you hot and stuffy, consider changing up your quilt cover for one that breathes well and helps keep you cool. Even the best warm weather quilt will be hampered by a synthetic cover that traps sweat against your skin. Try our Vintage Softwash Sets for beautifully soft, breathable cotton that boasts excellent temperature regulating properties.